Is it time to reevaluate how we treat scores for AAA games? Nick D. doesn’t think so. Final Fantasy XV was released to good review scores. As of the date of this article, it holds an 84 on Metacritic. For many games, a score in the 8s would be a cause for celebration among ever-anxious fans. This was not the case for Final Fantasy XV. When the review embargo ended and scores started flooding in, many fans were left disappointed at what many described as a “lukewarm” reception for the highly anticipated game. 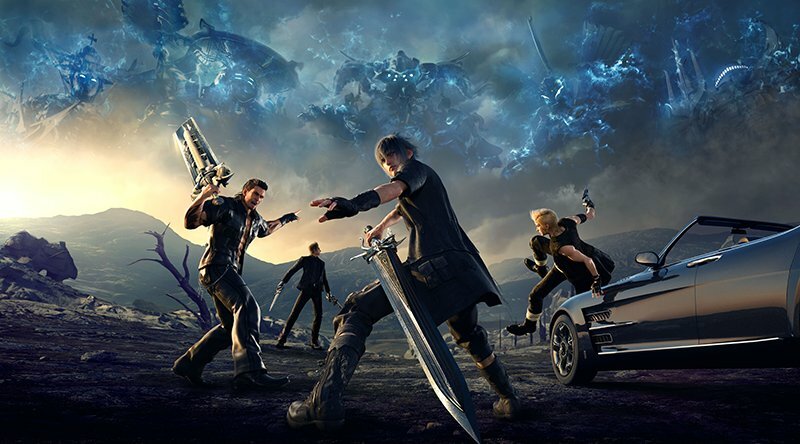 While some of the dissatisfied were already disgruntled fans, who would disparage the game even if it got straight 10s, there were a sizeable number of people that simply thought a game of the magnitude of Final Fantasy XV demanded a higher review score before anyone could claim it was good. This leads to the question of whether AAA games, the ones with massive budgets and long development times should be held to a higher letter grade standard than other games. In other words, a good AAA game should be one that reaches the 9 zone instead of the standard 8 that non-AAA games use. I intend to argue that, while it makes sense at first blush to treat these games to a higher letter grade standard, this argument falls apart when you start looking deeper into the actual industry. Obviously, every game is held to different standards by reviewers, who take into account many variables to assign a rating such as size, genre and comparable games. What we’re talking about today is what that score should mean to the reader of the review. Should an 8 from a reviewer be considered just as good no matter the game, or should an 8 for a game like Final Fantasy XV mean something different than an 8 for something like Enter the Gungeon. For reference, I’m using the generally accepted guideline that a 5 or lower game is bad; 6 is flawed; 7 is average; 8 is good; 9 is great; 10 is excellent. I only mention this because there are people who consider 5 to be average despite the fact that it empirically is not. What’s happening with Final Fantasy XV is becoming commonplace among AAA titles. It scored in the 8 range. From the above scale, this means that the game is good. However, there is an argument that an 8 for a game that was so hyped, had such a long development cycle, and had a budget up the wazoo isn’t good enough. There is a real argument here, at first glance. The idea is that the bigger the game, the bigger the expectations. Indeed, part of the blame can go on the developers themselves. In the case of Final Fantasy XV, developer Square-Enix has been hyping it to high heavens since its re-reveal at E3 several years ago. They’ve been stoking the flames of the fanbase, promising a game beyond any that they’d ever experienced. This is an infuriatingly common practise in AAA development, one that exists to sell preorders and almost always leads to disappointment. With such hype behind the game, why wouldn’t it be natural to expect it to soar beyond a standard 8 rating? After all, most AAA developed games come from venerable series with long histories of quality behind them. This leads to further expectations from the fanbase. I’ve seen numerous times on forums people claiming that an 8 is good for a game, but it’s a bad score for a Final Fantasy game. Again, this is the natural placement of a higher standard on a series that has consistently reached a high bar of quality. In Final Fantasy XV’s case, there is also a special point that dissatisfied fans are relying on. Final Fantasy XV, under the title Final Fantasy Versus XIII, was announced in 2006. This technically means that the game had a 10 year development cycle. Though the game’s actual development cycle was much smaller due to a lack of action during those early years, this point has stuck in the craw of many fans. “This game doesn’t play like something that was developed for 10 years,” has been something of a rally cry for the dissatisfied. Many of these people have voiced the opinion that an 8 simply isn’t good enough for such a long cycle. All of these points lead to the conclusion that a game like Final Fantasy XV should get a higher score than non-AAA games in order to be considered good. A game like this needs to break into the 9 range to be worthy of the hype, the development time, and the sheer cost that went into it. At its core, a review score exists to give an at-a-glance way for gamers to see if a game is worth their time. An 8 for a AAA game could be described as a disappointment considering the usual hype machine. Thus, a good or average score may lead to a disproportionately disappointing experience from gamers, making the standard scale not applicable. The problem with this train of thought is that the standard scale exists around the AAA market. An 8 is an 8 is an 8, to be exact. All of the above reason – money, established franchises, hype, long development times, etc. – actually don’t matter. Why? Doesn’t it make sense that these factors be part of the equation, you might ask. I respond that they absolutely should be part of the score. The problem with many people’s thinking is that they already are. It all comes back to reviewers. These are paid professionals who exist to run games through the gauntlet before assigning a score. Ignoring the constant (and generally unfounded) accusation that reviews are bought, the job of these reviewers is to take all surrounding information into account when assigning a rating as part of their written or video review. Without going too deep into the reviewing process, the key to the whole machinery is comparables. A reviewer scores like with like. They do not score a low budget indie title against something like Call of Duty or Final Fantasy. AAA games of the same genre are scored based on how they compare to other games in their own franchise and the genre at large. This leads can lead to a table tennis game getting the exact same score as Dark Souls. This doesn’t make them equals compared to each other, but rather, it makes them of the same quality among their comparables as well as other factors such as gaming climate at the time. Take Final Fantasy XV – many reviewers mention the long development time, and everyone knows the vastness of Final Fantasy’s back catalogue and past success. No reviewer is treating the game as if it were a completely unique and new release. Comparables need to be used. Even features such as the open world, which is relatively foreign to the franchise, are compared to the open world from comparable AAA RPGs such as the Witcher 3 or Dragon Age: Inquisition. Reviewers also take variables into account than many gamers don’t notice. In particular is the gaming climate. It’s common for Final Fantasy XV detractors to bring up the fact that IGN scored the often-reviled Final Fantasy XIII higher than XV. However, the gaming climate was very different between the two instalments. RPGs, particularly action RPGs in the case of Final Fantasy XV, have come a long way in years with many stalwart games such as Dark Souls and the Witcher 3 raising the bar. Whereas, Final Fantasy XIII was one of the only standard JRPGs on the market at the time, with its only competition being much lower budget titles. This climate leads to different expectation being placed on different games. That’s not to say that reviewers are perfect. Hype affects everyone, even professionals, and there are times where things simply aren’t gotten right. For example, Grand Theft Auto 4 was scored so high at the time that it is listed as one of the highest scored games of all time by Metacritic. It doesn’t take much thought to notice something wrong with that. Hype happens and can inflate the ratings of games, but it’s not common. Professional reviewers exist to filter this out. Are there exceptions? Of course. But it’s not common enough to decry the entire industry, or weave a web of half-baked conspiracy theories every time a game you want to fail does well. Putting this together, the reason that people should consider an 8 from a AAA game with exactly the same excitement as an 8 from a low budget game is because all the bundle of issues that people have with AAA development have already been taken into account. So, if you think Final Fantasy XV should be looked at from the perspective of its massive franchise and the huge development cycle, the good news is that it already was. And, in that light, it was given scores in the 8 range. Should the staleness of the Assassin’s Creed or Call of Duty franchise be taken into account when reviewers are assigning a score? Yes, and they are. An 8 is an 8 is an 8. The disconnect comes from personal disappointment. A person may think that, personally, the game needs to score higher to be worth their personal time. That’s a totally valid and fair point. Subjective standards will always vary from person to person, and everyone is free to set the bar as high or low as they want even if it’s based on petty or flat-out inaccurate reasons. The problem arises when people impute these subjective standards onto the actual score. An 8 is good. It doesn’t matter that, in your opinion, you would have preferred the game to get 9s before you start seeing it as worthy. The 8 remains good. This conflation of the objective score and the subjective standard is the problem currently with AAA expectations vis a vis review scores. Unfortunately, there is no way to force people to change their own personal standards. What gamers need to remember, however, is that the entire point of review scores is to give gamers a snapshot of the game’s quality. The value of these scores does not vary between genres, development costs, or studios. It would make little sense to adjust the score to make it so only AAA games reaching 9 will be considered good. Not only would this shorten the already tiny range of good games (currently 8-10), but it would also make absolutely no sense when an 8 currently expresses that quality well enough. All of this is simply to say, when someone tells you that an 8 doesn’t make a game good because of a whole host of reasonable reasons, you can turn to them and say an 8 means the game is good. It might not be everyone’s cup of tea, but we’ve judged 8 to mean good in today’s metric and that’s what the game is, AAA or not.